The New Moon in Gemini is also a solar eclipse. The eclipse takes place in the first degree of Gemini, square Neptune in early Pisces. A solar eclipse can only happen at the time of a New Moon, when the Sun and Moon are in conjunction. If the Sun, Moon and Earth are in line, and they also lie in the same plane, the eclipse can occur. The Moon passes between the Earth and the Sun, obscuring the disc of the Sun either totally or partially. The type of the current eclipse is called an annular solar eclipse, because the Moon covers only the center of the Sun, letting a bright ring burn around the dark Moon. The Sun and the Moon, the luminaries, are the two most important factors of any astrological chart. The Sun represents the self, the ego, the purpose, and it is concerned with the future. The Moon is our memory, it gathers our past experiences. An eclipse of the Sun by the Moon can thus feel like a halting moment. It can offer a moment to pause and reflect, and then to make a conscious adjustment of the direction one is heading towards. While the Sun represents one’s individuality, Neptune and Pisces represent the collective. The square aspect between the two planets brings tension between them. Neptune tends to cause confusion. It tends to dissolve anything it touches, and the blurring of one’s boundaries can feel frightening. Bringing the energies of the Sun, Moon and Neptune together, becomes the challenge. Squares can be highly productive aspects though. They make us act and take the challenge. The eclipsing Moon can actually help you to focus yourself. In case you feel confused or lost, use the image of the burning solar ring around the Moon to put you back on the tracks. 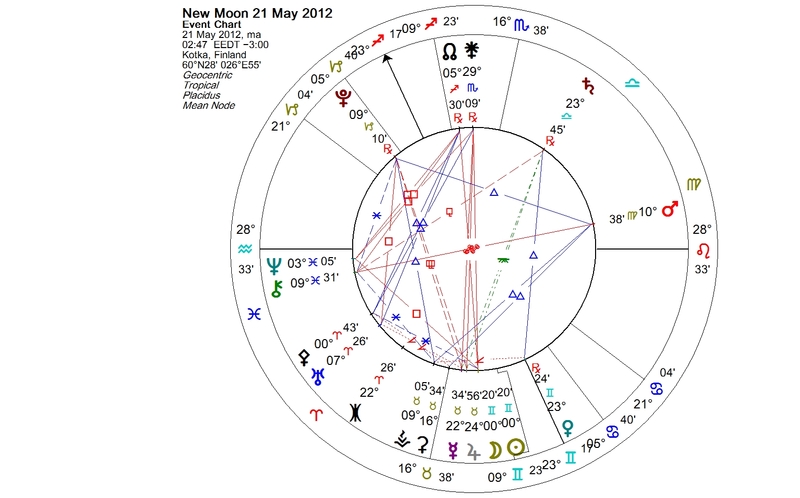 This entry was posted on Sunday, May 20th, 2012 at 10:11 pm	and is filed under Eclipses, New Moon. You can follow any responses to this entry through the RSS 2.0 feed. You can leave a response, or trackback from your own site.